It can be said that almost every master bedroom has its own bathroom but those traditional ones can get rather boring. 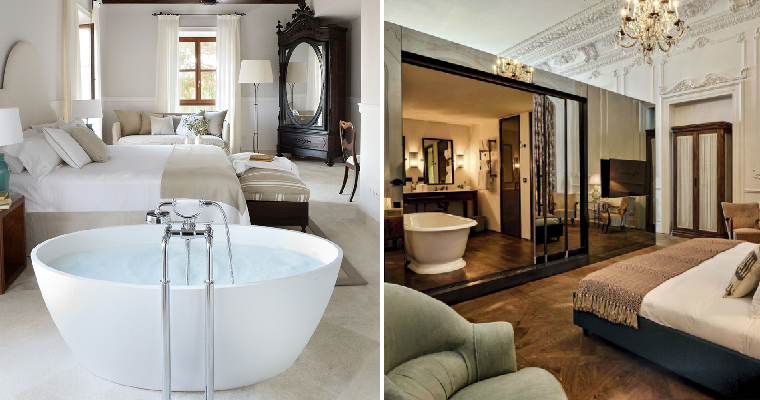 If you don’t want those conventional bathrooms in your master bedroom then we suggest that you take things to a whole new level by emulating some of these chic hotel rooms. The bedroom is dressed up in a vintage style that looks gorgeous and not fussy, which makes it look relaxing and calm. The oval, freestanding tub at the side adds a nice touch that makes the room look more outstanding and you don’t have to worry about water spilling on the floor as it can be easily mopped up. This chic bedroom looks really comfy and warm, with lots of neutral colours and wooden floor planks. However, the focal point in this room is definitely the oval bathtub located at the side of the bed and if you’re feeling cold, there’s even a fake fire warmer to keep you comfortable while you’re in the tub. If having a freestanding tub in the room is not your thing, you can consider this bathroom idea where the shower area is separated by a glass partition behind the bed. With the right plumbing and flooring, you can save space and have your bathroom conveniently near. For those that prefer a more private option, this kind of bathroom in your master bedroom would suit you the most. If you don’t want the bathroom to be too obvious, just make it look as if it’s hidden behind a wall panel. It’s really easy to create your own bathroom in a bedroom, if it isn’t provided in the first place, just like this gorgeous hotel room. A nice little bathroom using mirrored panels creates the illusion of space yet keeps bathtime private as well. If you have the space in your home then this open plan style is certainly something different that you might want to explore, as it looks simply awesome. Although the vanity becomes a dividing zone between the bedroom and bath areas, it still flows smoothly.